Blimey, this memoir was bleak. Jennifer Worth's third book about her years serving as a midwife in London's East End in the 1950s was much darker than the first two. It was well-written and the stories were all compelling, but it covered some serious stuff, including babies who died during delivery, botched abortions, children killed by tuberculosis, a father who prostituted his daughter on a ship, and the Contagious Diseases Acts. I need to pause here to explain how horrified I was to hear about the Contagious Diseases Acts, which was passed by British Parliament in the 1860s. It allowed police officers to arrest any girl or woman they suspected of being a prostitute and to check her for venereal disease. Reportedly some officers took full advantage of this and basically raped the women while doing their "exam." There is such a story in this book, and it is dark, man. "Any woman of any age could be subjected to this horrifying treatment. At the time the age of consent was thirteen, so a child of that age could legally be regarded as a woman. The Contagious Diseases Act affected only working-class women, because upper-class women never walked in the streets alone, but would be accompanied or in a carriage. Men of any age or class were exempt from arrest and examination, even if caught in the act of soliciting, because the Act of 1864 was specifically designed for the control of women." The Acts galvanized the women's movement in England, and mercifully the CDA was repealed in 1886. The case of the sea captain who encouraged his daughter to sleep with every man on ship, including himself, was also shocking. The midwives learned about her because the girl had become pregnant, and good ol' Chummy was the one who helped deliver the baby on board the vessel. The story had a nice coda because that night Chummy met an officer she eventually married. There are also lively stories of Sister Monica Joan, who discovered the joys of taking a cab ride instead of the bus, and we learn about the woman who runs the local pub. The end of the book discusses how the neighborhood changed in the 1960s, and why the midwives and nuns eventually closed their practice. "One by one the docks closed; air freight had replaced the old cargo boats, and the dockers became redundant. At the same time demolition of bomb-damaged and slum property started, and people were rehoused out of London in the new towns. For many this was life-shattering, particularly for the older generation who had lived their entire lives within a radius of two or three streets, close to their children and grandchildren. The rehousing programme tore apart the extended family, which had provided the unity and been the strength of East End life for generations." 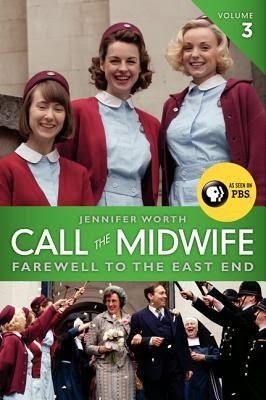 I listened to all three of Jennifer Worth's Midwife memoirs on audio, read by Nicola Barber, who was an excellent narrator. This third book is filled with a lot of history and social issues of the day, which was interesting, but I had hoped for a little lighter fare. I would still recommend it, just be prepared for some sad tales.